So my cousins and I have this saying that something that is a small dessert like object it is called a “Goodie-bite”. We figure it’s still a goodie, even if we are limiting ourselves to just small bite. In our dutch family there are many treats we refer to as goodie bites. :) Today is filled with goodie bites on the Chic Runner, from fashion to a few cool tips. First off though, I would like to thank everyone for the wonderful get well wishes. With about 10,000 mgs of Vitamin C floating through my system, 200 oz. of tea, and of course NyQuil for good nights sleep, my seal cough is slowly going away. This leads to another interesting fact though. Because of my run down state I have not ran this entire week. I realized that if I continue running, I will make myself more sick and not properly allow healing. While talking to one of my friends who knew I was sick they said, “You are either deathly ill, or healthy, there is no in between for you.” Which is unfortunately very true. So I figured I’ll run a long run on Saturday and just start fresh next week, and work hard, instead of doing three weeks of crappy training, because I would continue to be sick. We’ll see how that works out. We have this little thing that Starbucks introduced called the Power Protein Plate. It basically has all my life staples in it, including cheese, an apple, a bagel, peanut butter and grapes. Now it’s 4.95, which is a little pricey, but at the same time, it’s on the go, easy to eat and is super tasty. 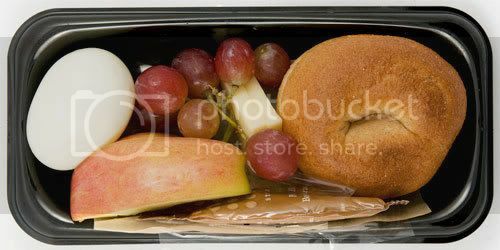 Just make sure the sprig of grapes is ripe, and not ‘sad’ as some websites have stated some of the plates to be filled with ‘sad grapes’. I wouldn’t want anyone to have sad grapes and blame me! The plate has 330 calories with peanut butter, 260 without which is about one-third of your daily protein intake. Also another food tip from Eat This, Not That! (my favorite book of all time) Swaps Section. 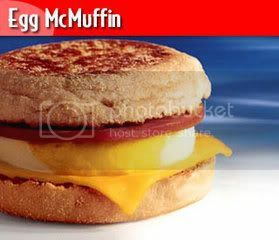 You can eat two Mc Donald’s Egg McMuffin’s for the same amount of calories as one sesame seed bagel with cream cheese. It may be shocking, but it’s true, and that is the exact reason why I love this book. I used to always think that a bagel with cream cheese (okay, maybe the amount of cream cheese I was putting on was a little unnecessary) was much better than eating something like a McMuffin. Wrong! That’s what the book taught me in so many different ways. It’s so helpful to keep around, I swear. So the book is not only great because not only because I am obsessed with Egg McMuffins, but because it reflects what we think is the key to successful weight loss: satisfying your cravings with smarter choices, not eliminating the foods you love altogether. So another plug for the book, I know, but I’m shamelessly a promoter for it, it’s amazing. Hope everyone has a great weekend, and next week something big will happen at Chic… besides me giving a review of the new oatmeal at Starbucks! :) Get Excited!